Built in 1924 by architect C. D. Wegstaff, this 18-hole layout features wide fairways with well positioned grass bunkers on the Carpentersville golf course. By today’s standards, the greens are small and well guarded by sand bunkers, placing a premium on shot making. Covered with Bentgrass and mowed velvety smooth, these elevated greens create a challenge for all. All players must register in the Pro Shop. Proper attire is required at all times. For Men: Shirts with Sleeves must be worn. For Women: Sleeveless Shirts are allowed. Please no Tank, Tube, Halter or Swim Tops. For All Players: Swim Trunks, Gym Shorts, Cut-Offs and Short Shorts are not allowed. Each player must have own bag and clubs. Rental clubs are available. Food and beverages are NOT permitted on the golf course grounds unless purchased from the clubhouse. Illinois law prohibits the sale of alcohol to persons under 21 years of age, guest may be asked to present identification. 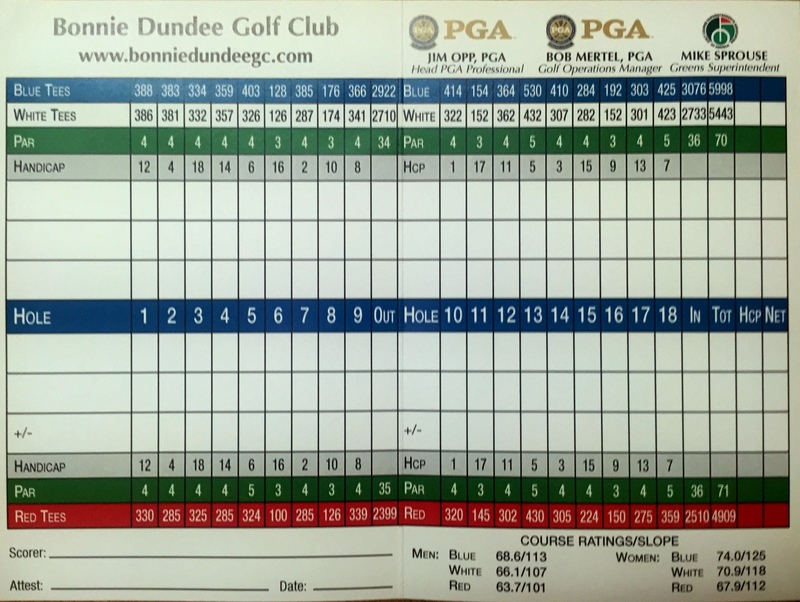 Bonnie Dundee Golf Club is the ONLY authority licensed to sell and serve liquor for consumption on the premises. Therefore, no alcohol can be brought onto the licensed property. If a golf event sponsor wishes to donate food or drink items for distribution to guests during the event they must be purchased by prior arrangement through the food & beverage department. One long Blast of siren = Leave course immediately and seek appropriate shelter. If lightning is seen or likely to occur in an approaching storm, proceed immediately to the clubhouse, or seek appropriate shelter. Each player is responsible for his/her own safety.